As B2B companies enter the realm of social media, they are faced with many challenges. The biggest is learning how to deal with the quantity of available information on the social web and determining what really matters. Many B2B companies approach this data by simply counting followers, when they need to develop a process for interacting with prospects and customers, and gaining insights from those conversations. This session will present a framework for establishing a social media monitoring program that does not exist in a silo, but connects these efforts with your higher level business objectives. 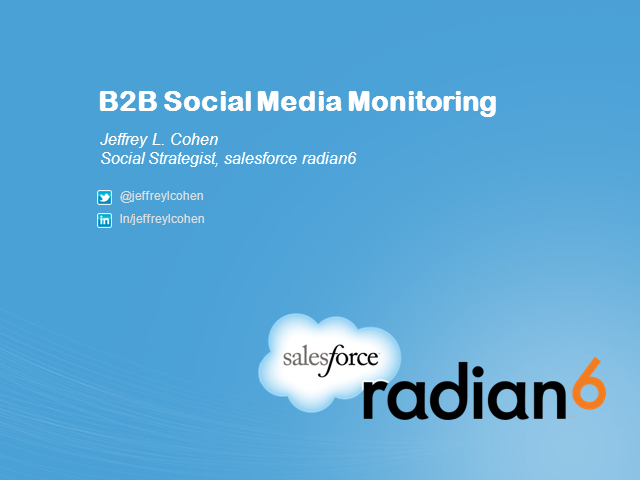 Jeffrey L. Cohen is a social strategist at Salesforce Radian6, a salesforce.com company. Jeff works with enterprise companies to assess their social media strategy and adoption, and advises them on how social media marketing, communications and engagement can help them meet their business objectives. Jeff is the co-author of The B2B Social Media Book (Wiley 2012), the definitive reference for B2B marketers looking to master social media to generate leads and revenue, and is also the co-founder and managing editor of SocialMediaB2B.com.